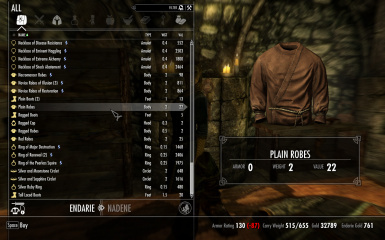 Corrects keywords and inconsistent weights and value settings for Skyrim's clothing, jewelry, and clutter. Circlets can be worn with hoods, hooded robes have been replaced with separated hood & robe versions, and enchanted jewelry now scales based on quality. 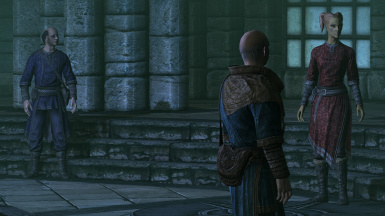 NPCs are attired in outfits that are appropriate to their position and background. You are not allowed to upload or distribute this file on any other website or platform. You are not allowed to use the assets included in this file without permission from the creator of those assets. You are not allowed to package this mod as part of a mod collection. You are not allowed to use this file in any mods/files/collections that are being sold or distributed for money. You are allowed to create compatibility patches for this mod as long as the patch requires that the user download the main file from this page in order to work. You are allowed to include keywords, item stat changes, and other record edits in your mod for the purpose of maintaining compatibility and consistency with CCF. However, other assets, including all texture and mesh files, require additional permission before you may include them in your mod. All assets that originate from other authors require permission from those authors. If you wish to translate this mod into a language other than English, your translation MUST require that the user download the original file from this page in order to work. You have permission to upload and distribute, on nexusmods.com, only those portions of this mod that are required for the translation. Do not post translations on additional platforms or websites without written permission from the mod author. You are NOT permitted to release any stand-alone translations that would work without the user first downloading the file from this page. - Unofficial Patch team for various fixes that have been incorporated into this mod, for the female elf circlet meshes, the beast race meshes for the fineclothes02 hat, and many of the 1stPerson clothing meshes. 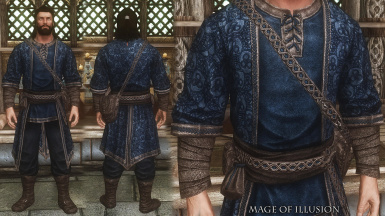 Removed the LongHair flag from Thalmor Robes. Removed "old" file from femelfcirclets folder. Corrected priority on the ThalmorRobesAA. Corrected script properties on the Necromancer Robes of Extreme Destruction and Necromancer Robes of Minor Conjuration. 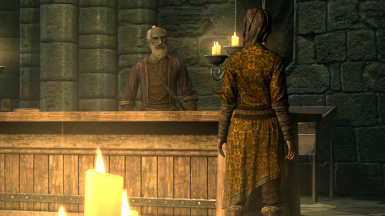 Added Thalmor Hood to the table in the Thalmor Embassy next to the other clothing items in order to allow the player to complete their disguise during the Diplomatic Immunity quest. 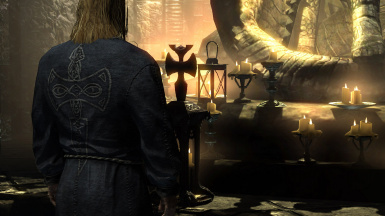 Added a playable version of the Daedric Robes that can be found inside the Shrine of Mehrunes Dagon. Adjusted the stats on Ulfric's Armor, Armguards, and Boots. All three items are now heavy armor. 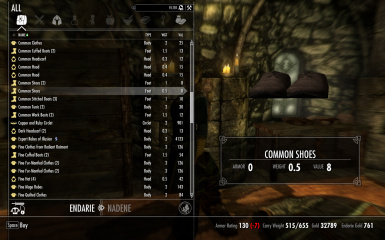 Created Temper recipes for Ulfric's Armor and Boots (the Unofficial Patch adds a temper recipe for the Armguards). Removed VisuallyDark keyword from Cicero's clothing and Jester's items. 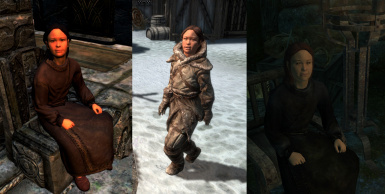 Renamed "Child's Skaal" clothes and "Child's" common shoes so they follow the naming convention of the other children's clothing. Renamed Dunmeri Tunics and Hoods for easier sorting (placed color descriptor after "Dunmeri"). Capitalized "Fur-Lined" in the names of the new mage hoods. Corrected misspelling in name of DLC2TelvaniRobes. Removed armor rating from dunLabyrinthianMazeCircletReward. Large number of outfit changes to various NPCs. Many of these new outfits feature new, unique textures created by Gamwich. Completely reworked the new outfits assigned by CCF. In most cases, these changes are now done via quest aliases and can be disabled in the new configuration menu. - All of the various mage robes (Novice Robes of Alteration, Adept Robes of Conjuration, Expert Robes of Destruction, etc.) now have unique textures that reflect each of the individual schools of magic (textures courtesy of Gamwich). - Court Wizards will now wear college robes that reflect their specialized school of magic. 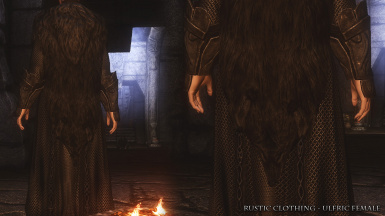 - Priests and Priestesses of Talos, Kynareth, Dibella, Azura, and the Divines (Solitude) wear robes with new, unique textures created by Gamwich. - Orc mages wear green robes. - Synod mages wear white robes. 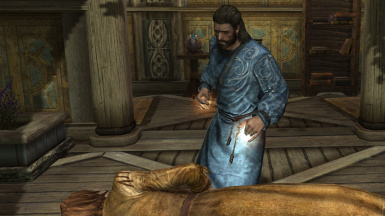 - Alchemists and other miscellaneous NPCs wear default blue robes. 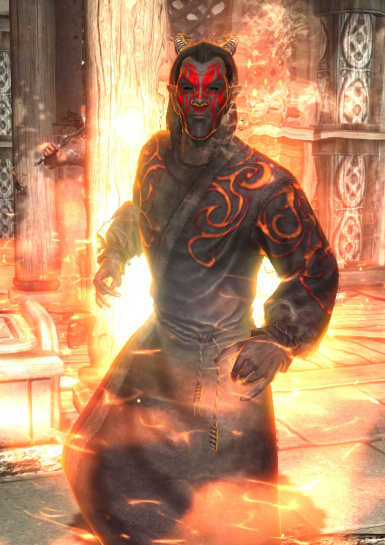 - Dremora now wear black daedric robes with a new texture created by Gamwich. 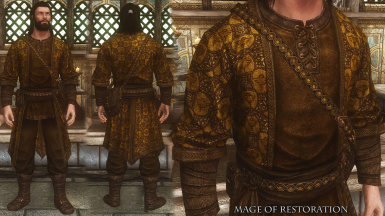 - Vigilants of Stendarr wear new chainmail robes and hoods (textures courtesy of Gamwich). Vigilant outfits have also been reworked so that they will spawn matching Steel boots and gauntlets, rather than a mis-match of different styles. If Wet & Cold is installed, Vigilants will equip fur-lined hoods in cold regions and regular hoods in warmer regions. - Jarls, their Stewards, and their Housecarls will now wear clothing that better reflects the rank and allegiance of the jarl and his appointees. 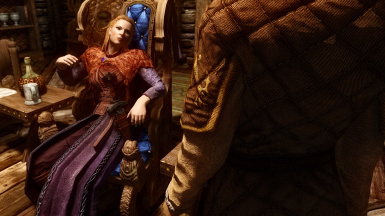 Imperial-allied jarls will wear Imperial-style outfits; Stormcloak-allied jarls will wear Nordic-styled outfits. The jarls and their appointees in the major holds will generally have better, more expensive clothing and armor than those in the minor holds. When jarls and their courts are replaced during the civil war questline, the replacement NPCs will now have their outfits upgraded to reflect their new rank and station, though in most cases, their outfits won't be identical to the NPCs they are replacing (due to differences in allegiance and to individual NPC preferences). - Asgeir will wear Wedding Outfit for wedding, then revert to his normal fine clothes. - Hunters will use a greater variety of clothing (farm clothes, fur armor, or hide armor). If using Wet & Cold, then some hunters in cold regions will use Skaal outfits. 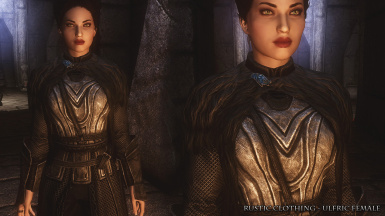 - Some Dark Elves found around Skyrim will now be wearing the Dunmeri Tunics from the Dragonborn DLC. Replaced older textures with Gamwich's textures for the female version of Ulfric's armor and the additional mage hood colors. These had previously been included in "Rustic Clothing" and have been included here with his permission. Added a new "Protective Clothing" option. This must be enabled in the mod configuration menu. This option allows clothing to provide some limited armor value. This feature is still a work-in-progress and currently only applies to the player. Changed all Hooded Robe records to remove the hoods and make them identical to the non-hooded versions. This should reduce conflicts arising from bashed patches and/or other mods re-introducing the hooded robes to the leveled lists. 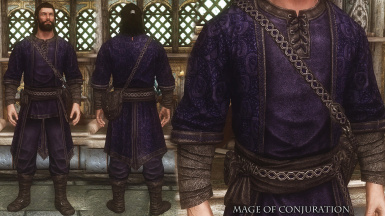 CCF may still conflict if mods add brand new hooded robes to the list (or those editing the vanilla ones). CCF_HoodedRobeSwapScrpt was changed to function exactly like the WAF_ArmorSwapScript, so if the player does pick up one of the previously hooded robes, there won't be duplicate instances of identical robes in their inventory. All instances of the WAF_ArmorSwapScript were also replaced with the CCF_HoodedRobeSwapScript to help avoid confusion when installing the mod. Archmage Robes no longer have attached hood and have been separated into Archmage's Robe and Archmage's Hood. Enchantments and stats have been adjusted appropriately, and the Archmage's Hood has been given a higher-ranking Fortify Magicka enchantment. Hooded Mythic Dawn Robes and Hooded Dunmer Clothing no longer have attached hoods. All instances of these items will now be found as separate robe and hood items. 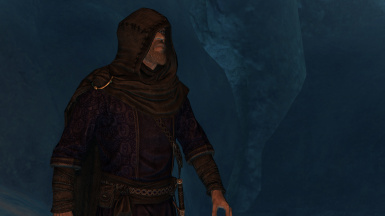 Hooded Thalmor Robes have all been replaced with separate robes and hoods. Conditions on the embassy disguise packages have also been changed to account for this. In addition, these package conditions are now based on keywords, so other mod-added gear can easily be made to work as a disguise. Prevented long hair from clipping with Dark Brotherhood version of the Redguard/Alik'r Hood. Also, ears would clip through these hoods; this clipping has been eliminated for most races and greatly reduced (but not completely eliminated) for female elves. Ears no longer clip through Mythic Dawn Hood. Circlets can still be worn with the Mythic Dawn Hood, but to prevent clipping, they aren't visible on most races when wearing this hood. Circlets can still be worn with the Thalmor Hood, but to prevent clipping, they will not be visible on Argonians when wearing this hood. Circlets can still be worn with the Vampire Hood, but to prevent clipping, they will not be visible when wearing this hood. Temple Priest Hood (from Dragonborn) will now use the proper meshes for Argonians and Khajiit. 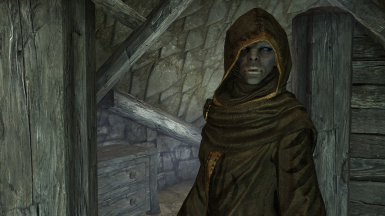 Also, circlets were not appearing when this hood was worn by an Argonian; this has been fixed. A number of potions, especially the Fortify and Fortify Regeneration potions, were using the wrong meshes; these have now been corrected. The poison meshes and mead bottles meshes have been edited to use the correct cubemaps. Mead bottles now use ShinyDull_e.dds (like the wine bottles). Poison bottles now use ShinyGlass_e.dds (like the potion bottles). Replaced the UpperEndTable02 and SafewithLock containers in the Hearthfire houses with the correct BYOH non-respawning versions. Also replaced the safe in Proudspire with the empty BYOH player safe. Injected the new furniture leveled lists, so they could be shared with CACO, ClothingCraft, and any other mod that wants to use them. Carried over more specific wine names from CACO (i.e. Alto Noir, Village White). Also, reduced weight of honey from 1.0 to 0.5 for better consistency with CACO. Renamed Dunmer outfits to "Dunmeri Tunic" and added Brown/Blue/Red to name to distinguish between the color variants. Renamed all college/mage clothing to add the word "mage" (for example, "Novice Robes" are now "Novice Mage Robes"). Renamed some of the upper-class and noble clothes. Renamed Merchant Clothes to Fine Clothes. Renamed the Fine Fur-Mantled Clothes to Noble Fur-Mantled Clothes. Renamed ClothesPrisonerBloodyShoes "Bloody Footwraps"; corrected the texture used by the ground model (it wasn't using the bloody version). Did same for ClothesPrisonerRagsBloody. Various versions of Blue Robes will now be converted into a single version upon pickup by player to avoid duplicates within the player's inventory. The same will also happen for any other identical vanilla items; these items will now be swapped for a single default item. Mageapprentice and Magejourneyman variants now have unique normals to improve the appearance of their textures (courtesy of Gamwich). Created new Mage Boots to match the different ranks of college robes. Removed the fur trim from the female mage hoods, so they now appear similar to the male version. Added separate fur-trimmed mage hoods for both genders. Removed attached hat from ClothesFarmClothes03withExtras, and corrected the ground model. Fixed Ilari's robes so they will now appear correctly for both males and females (correct color and no heartstone harness). Also renamed the robes "Ildari's Robes" and added Telvani Shoes to her outfit. Added VendorItemAnimalPart keyword to dunWaywardPassSkull01 and BoneHumanSkullFull so they would get categorized as "Remains" by SkyUI instead of Misc. Removed the VendorItemOreIngot keyword from the Broken Iron/Steel weapons and the Nord/Imperial War Horns, so they would not be categorized as Ingots by SkyUI. Also, adjusted the weight and value of these items to make sure they were consistent with WAF stats. Modified keywords on the Linen Wrap (removed clutter, added WAF_ToolsMaterials). Made some adjustments to the values of a number of clothing items: generally making higher-end clothing and shoes more expensive. Also adjusted prices for college/mage clothing, generally making these items less expensive. Corrected inconsistent base values for enchanted college robes versus the unenchanted robes. This also includes DLC01_WESC09TaronsRobes. Changed the EnchRobesFortify[...] to auto-calc the enchantment values, the same way that the EnchRobesCollege[...] enchantments do. The non-auto-calc values were artificially inflating the value of the warlock and necromancer robes. If anything, these robes should be worth less, not more, than the fancier college robes. Added missing college mage robes to WICommentCollegeRobesList. Updated female elf circlet meshes to latest version from USLEEP. Carried over a few other minor changes from USLEEP. Included copies of Armor-Addon records for: NecromancerRobesAA, WarlockRobesAA, and MageRobesAA. USLEEP changes these records to remove the amulets from them, which is contrary to the changes that CCF makes. CCF needs to overwrite these changes. Renamed the new mage hood textures to align with naming conventions used by the vanilla textures. Removed a number of old records and edits that were no longer being used. This includes edits to some outfits that are now being handled by quest aliases using unique outfits, unused COBJ recipes, and minor positioning edits to the BYOH display cases. Removed change to the Default Object Manager (ToolsMaterials keyword). This change is now included in WAF, so there's no need to duplicate it here. Female clothing variants should now look correct in first-person. This was accomplished by either creating duplicates of the female 1st person mesh for each texture variation, or by removing the male & female 1st person data from the Armor Addon records. By deleting the 1st person entry, it forces the game to use the 3rd person meshes in first person. Where the 3rd person meshes did not look okay in 1st person, I instead made copies of the female 1st person meshes. The correct ground model is now being used for the female ClothesMournersClothes (Dark Common Clothes). Amulets will no longer show when wearing the Fine Quilted Clothes. Amulets look nice when worn by females, but had pretty bad clipping when worn by males. Added "Graphics" and "Invent" bash tags to the file description. 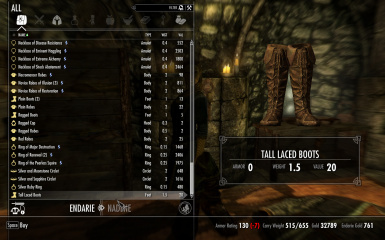 The "Tall Laced Boots" (WenchBoots) now have a properly matching male version rather than using the Redguard boots. Changes to improve compatibility with robe-wearing NPCs from other mods. 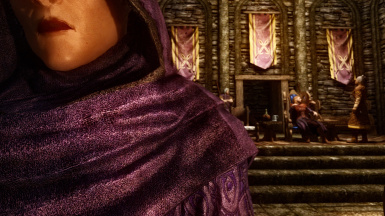 All Thieves Guild hoods can now be worn with circlets; however, circlets won't be visible when worn with certain TG hoods in order to prevent clipping issues. 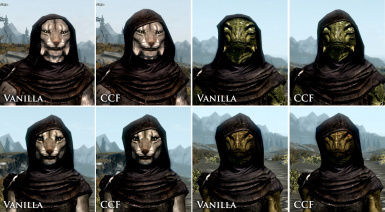 Monk, warlock, and necromancer cowls will now fit Khajiit characters much better. All of these hoods have been redirected to an unusued vanilla mesh designed for Khajiit, rather than sharing the Argonian mesh. Argonian Male and Females are also using the Khajiit hood meshes. 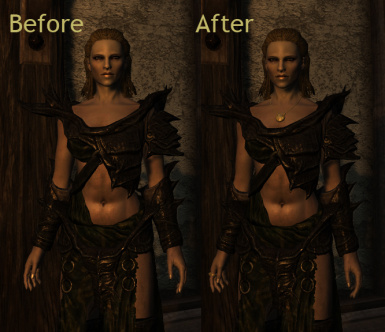 If users wish to revert this change and have Argonians use the original Argonian hood mesh, then they can simply delete the downloaded meshes found in the Meshes\Clothes\Monk folder. 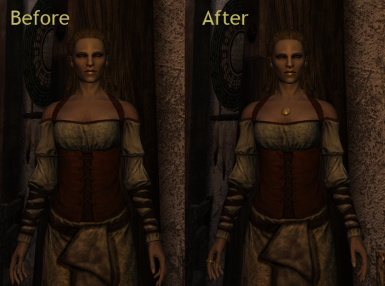 Previously used, enlarged Monk hood meshes were removed (only Khajiit and Argonians were still using these). 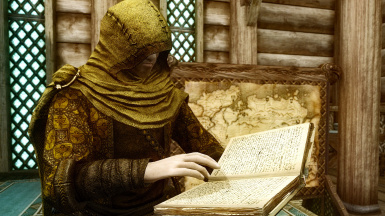 In order to prevent clipping, circlets will not be visible when worn by Argonians with the monk-style hoods. 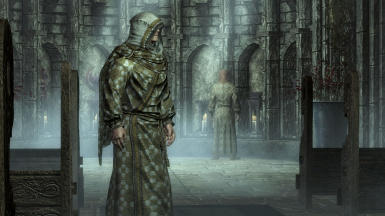 Added a script to all of the hooded robes, so that if they are added to an NPC by another mod (or if the changes to the Lvl Lists get reverted by Wrye Bash), the Hooded Robes will be converted into the equivalent individual Robe + Hood combination. This should improve compatibility with certain mods, where NPCs were found to be mostly naked because they had been given both a Hood and a Hooded Robe. Modified outfit worn by Galathil (DLC1Surgeon) to a gray robe with separate red hood. Removed edits to the Executioner's items; these changes are now part of Weapons & Armor Fixes Remade. Carried forward conflicting edits from Unofficial Patch for Fine Hat (fineclothes02), including the new beast race meshes from USLEEP. Made several other minor edits for consistency with the Unofficial Patch and the WAF 5.2 update. Added Hearthfire Display Case Fix with permission from Krucify. Re-edited the WAF keywords, which had gotten reverted to their old names in version 1.41. Quick edit to WAF_SwapArmorScript to remove notifications. Removed changes to DLC1ClothesVampireLordArmor & DLC1ClothesVampireLordRoyalArmor. Carried over relevant changes from recent updates to the Unofficial Patches and Weapons & Armor Fixes Remade. Adjusted prices for glazed & silver dinnerware... increased both slightly. Changed "Building Materials" crafting category added by Hearthfire to "Tools & Materials" and made it a functional category for mods not using Hearthfire via a new injected keyword (WAF_ToolsMaterials). Carried over USKP changes to StrongBox & TreasStrongBox. A handful of other small changes, mostly related to maintaining consistency with Weapons & Armor Fixes and Complete Crafting Overhaul. Included the furniture and cooking pot loot changes from the last version in with the separate files (some of the changes are in the vanilla file, others are in the Hearthfire file). Updated for consistency with Weapons & Armor Fixes Remade version 5.0. Wooden Shovel was renamed back to just "Shovel" as the sound associated with this item indicates that it's made of metal. 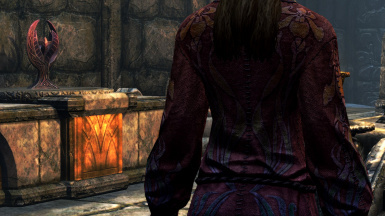 The Vampire hood (Serana's hood) will now look correct in the inventory view and when worn by argonians and khajiit. A handful of keyword additions and minor price adjustments. LEGENDARY VERSION: Overhauled the loot lists for the following furniture: cupboards, dressers, end tables, and wardrobes. LEGENDARY VERSION: Pots now have a high likelihood of containing some type of cooked food. Corrected a few minor conflicts with Complete Crafting Overhaul regarding edits to Outfits. Rebalanced ore costs. The previous prices had been balanced for Complete Crafting Overhaul. The new prices should now seem more reasonable if using this mod without CCO. Added WAF_JewelryExquisite_KRY keyword to all circets over 900 base gold and rings/necklaces over 700 base gold. Removed a few duplicate records that were creating errors in TES5Edit. Added a compatibility patch for Interesting NPCs. Corrected a few records that didn't get saved correctly in the Complete version. Removed changes to college hood meshes. Changed the outfit assigned to robed skeletons. This mod developed as an extension of and compliment to Weapons & Armor Fixes Remade. In general, Skyrim's clothing and clutter items tend to have fewer real bugs than the weapons and armor. However, there were several major inconsistencies in the way the game treated clothing, jewelry, and other items that I felt needed to be addressed. More consistent values & weights for clothing and misc items. Some previously unplayable or inaccessible items are now playable and/or accessible in game. Almost all instances of hooded robes have been removed from the game and replaced with separate robe and hood combinations. Allows circlets to be worn with hoods. Adds more diversity to the robed outfits worn by NPCs. Changes the outfits of certain NPCs to be more appropriate to their rank and position. New Jarls and their appointees will change into more appropriate clothing when they take over those roles during the progression of the Civil War quest. Adjusts the loot found in certain furniture containers to be consistent with the both the class and the type of furniture. The strength of an enchantment on a piece of enchanted jewelry is now properly reflected by the quality of the base jewelry. Female clothing variants will now use the correct texture in first-person. Necklaces and/or rings that were invisible when worn with certain clothing can now be seen. Corrects incorrect keywords on jewelry, clothing, and misc items. Potion bottles will now use the correct meshes, and Poison bottles will no longer appear flat and dull. Adds keywords that were missing from certain items that prevented them from being sold or properly identified by the game mechanics. Option to give clothing items a limited armor value. Version 2.0 requires Dawnguard, Hearthfire, and Dragonborn. - If you don't have all three DLC, you can use the 1.7 version. However, please be aware that I am no longer actively supporting that version. Rustic Clothing is required in order to maintain consistency with the added textures and normal maps. Weapons & Armor Fixes Remade is strongly recommended, but it's not technically required. I recommend placing this mod near the top of your load order, but after the Unofficial Patch. Load this mod AFTER Weapons & Armor Fixes, but BEFORE Complete Crafting Overhaul. As with any Skyrim plugin, there is no guaranteed safe method for uninstalling an esp file from an existing save. It is recommended that you start a new game whenever you remove a plugin from your load order or else revert to a save made prior to installing this mod. I want to thank the following mod authors for providing assets that were used in this mod. Thank you so much for permitting me to use your work and resources! Gamwich for creating all of the beautiful new clothing textures. The changes in this mod take several forms. The first type of change are straight-forward bug fixes. These are things that are obviously wrong, such as shoes that have the ClothingBody keyword when they should have the ClothingFeet keyword, an item that is using the wrong mesh or texture, or jewelry that appears invisible when worn alongside certain items. Enchanted jewelry now scales in quality similar to the way in which the game treats enchanted weapons & armor. You don't find low-end enchantments on daedric weapons, so why are there low-end enchantments on expensive diamond jewelry? With this mod, the power of the enchantment will be reflected by the quality of the base ring, necklace, or circlet. For example, a "Ring of Minor Stamina" will be a Silver Garnet Ring, while a "Ring of Major Stamina" will be a Silver Ruby ring, and a "Ring of Peerless Stamina" will be a gold diamond ring. Scaling the quality of the base jewelry in this way also allows the base value of the enchanted jewelry to better reflect the quality of that specific item. This also happens to be exactly how enchanted weapons & armor are treated in the game. Another effect of this change is that keywords such as "JewelryExpensive" now align more appropriately with truly valuable jewelry. Circlets can now be worn with all hoods, including those added by the DLCs. Due to clipping issues with some hoods, circlets will appear invisible when worn with certain hoods. Many clothing items now provide a small degree of protection, particularly quilted or heavily layered garments that appear to have leather or chain-mail components. Realistically, these garments should probably be at least as protective as some of the lighter vanilla armors, and I've tried to balance their stats around those values. NOTE: This feature is optional and disabled by default. Armored clothing is still considered clothing: it won't level your armor skills, it won't increase in rating as your armor skills increase, and it can't be improved. Currently, it only applies to the player, but I may extend the option to NPCs in the future. New Mage Boots have been added to match the different ranks of mage robes. Removed the fur trim from the female mage hoods, so they will now appear similar to the male version. New fur-trimmed mage hoods were added as separate items that can be worn by both males and females. 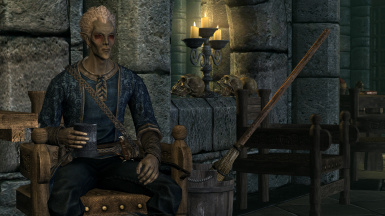 Ulfric's garments are now all considered light armor instead of a mix of clothing & armor and have the appropriate keywords. If you are using Smithing Perks Overhaul, you can improve these items with the Advanced perk. 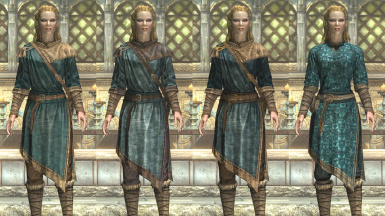 The female version of Ulfric's clothing now appears closer to what the male version looks like. The Tall Laced Boots now have a matching male model instead of using the Redguard boots. Removed the armor rating from the Amulet of Articulation and the Locket of Saint Jiub (Dawnguard). There is no longer any jewelry in the game that grants an added armor rating. DAWNGUARD: Vampire Lord Armor has been changed from clothing to armor. 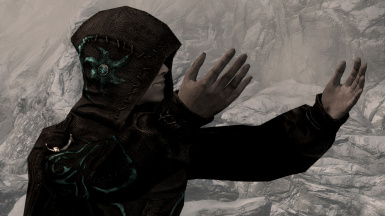 DAWNGUARD: Renamed Serana's Hood to "Vampire Hood," changed it to light armor and made it playable. Versions of this hood can also now be found on random vampires. If using Clothing & Clutter Fixes alongside my Weapons & Armor Fixes, then wearing this hood with the other pieces of Vampire armor will qualify for the Matching Set armor bonus. HEARTHFIRE: Children's clothing no longer weighs more than adult clothing. DRAGONBORN: Miraak's outfit is now entirely clothing instead of the jumble of properties and keywords that it was originally. The strongest indicators in the keywords and the internal naming of the items indicate that they were intended to be clothing not armor. 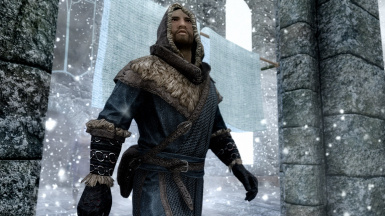 DRAGONBORN: Skaal garments are now clothing. Their name indicates that they were originally intended to be clothing. Lower-class clothing items are typically prefixed with "Common." Middle-class are prefixed with "Fine" and upper-class with "Noble." Many pieces of clothing have been given more specific names instead of having a dozen different items using the generic name "Clothing" or "Boots." Not everything has a unique name, so there is still some repetition but not nearly as much as before. The various types of tableware, which were all named "plate," "cup," etc. and are now named "Silver Plate," "Glazed Cup," "Silver Ewer," and so on. Gold coins are now called "Septims." 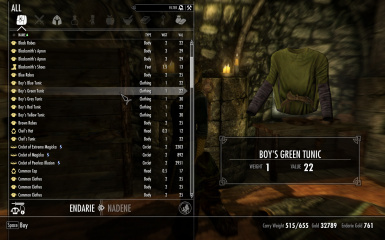 DRAGONBORN: Dunmer outfits have been renamed "Dunmeri Tunic" and are distinguished by the color variant. Please understand that I am not attempting to change the weight of items to conform to any sort of absolute real-world scale. My values are not intended to be pounds or kilograms. Rather, I've merely attempted to make the relative weight of items internally consistent when compared with other items in the game. All amulets now weigh 0.5 or less. Most necklaces already weighed 0.5 but some, like amulets of the divines, weighed twice as much. Their weight will now be consistent. Decreased weight and increased value for bugs in jars, and added proper keywords to allow them to be sold to alchemists or given to children as gifts. Corrected weight, value, and keywords for basic fork & knife (also made weaponized versions of these items match and gave them proper keywords so that perks that apply to daggers would also apply to these "weapons"). The basic fork & knives that were found in furniture have been replaced with weaponized versions. Corrected weight, value, and keywords for Glazed, Nordic, and Silver clutter. Silver items should be valuable enough to make it worthwhile for a beginning thief or petty criminal to steal them, but not nearly so valuable that they become a quick and easy way to get rich. I tried to price these items so that things like silver objects would be appealing to low-level thieves who have next to no money, but probably would not be worth the effort for higher-level characters or wealthier thieves. Many clutter items that were worth 1 gold before are now worth more. 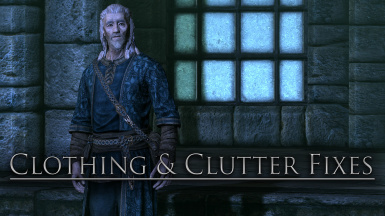 Most clutter items still have a rather poor weight-to-value ratio, but it's ridiculous to think that plates, buckets, baskets, tools, etc don't have some sort of intrinsic value in Skyrim's economy. Repriced unique jewelry items to be consistent with the new values I've set for the generic jewelry (which is now based off of the cost of their crafting components). Cupboards, Dressers, End Tables, and Wardrobes will now respawn. Also, they now use custom leveled lists so that the items they contain will be more appropriate for the apparent class-ranking of the furniture, as well as the type of furniture (i.e. cupboards contain dining and food related items, dressers contain clothing, etc). Pots now have a high likelihood of containing some type of cooked food. Display cases located in the three Hearthfire homes now have proper activation triggers so that you can more easily display your weapons. These changes are from Hearthfire Display Case Fix by Krucify. All instances of hooded robes have been removed from the game & replaced with separate robe and hood combinations. The various mage robes (Novice Robes of Alteration, Adept Robes of Conjuration, Expert Robes of Destruction, etc.) now have unique textures that reflect their individual school of magic and rank from Novice to Expert (textures courtesy of Gamwich). Court Wizards will now wear college robes that reflect their specialized school of magic. Priests and Priestesses of Talos, Kynareth, Dibella, Azura, and the Temple of the Divines wear robes with new, unique textures created by Gamwich. Priests of Arkay wear brown robes with brown hoods, and Priests of Mara wear plain robes with a yellow hood. The appropriate divine amulet has been added to the priests' outfits. Jarls, their Stewards, and their Housecarls will now wear clothing that better reflects the rank and allegiance of those NPCs. 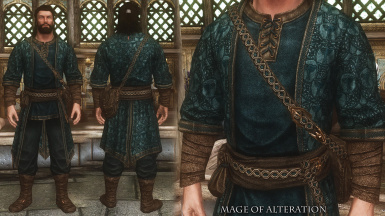 Imperial-allied jarls will wear Imperial-style outfits; Stormcloak-allied jarls will wear Nordic-styled outfits. The jarls and their appointees in the major holds will generally have better, more expensive clothing and armor than those in the minor holds. When jarls and their courts are replaced during the civil war questline, the replacement NPCs will now have their outfits upgraded to reflect their new rank and station. A few of the unique children now have clothing that better fits their role. Babette wears black robes. 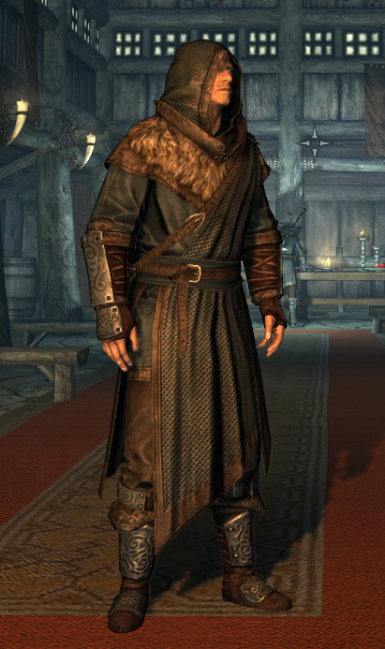 Fjotra wears brown robes, and Aeta (from Dragonborn) now wears Skaal clothing. The meshes for these outfits are from Little Caravans and More Children Wears. Vigilants of Stendarr wear new chainmail robes and hoods (textures courtesy of Gamwich). Vigilant outfits have also been reworked so that they will spawn matching Steel boots and gauntlets, rather than a mismatch of different styles. If Wet & Cold is installed, Vigilants will equip fur-lined hoods in cold regions and regular hoods in warmer regions. Asgeir will wear the male wedding outfit for his wedding, then afterwards revert back to his normal fine clothes. Dremora now wear black daedric robes with a new texture created by Gamwich. Vaermina's Devotees now have a 40% chance of having a matching purple hood. Necromancers and Warlocks have a 50% chance of having a black, grey, or brown hood. 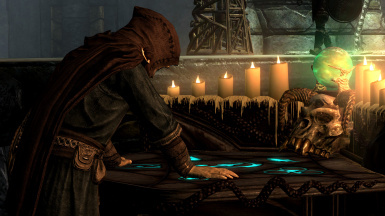 Necromancer or Warlock Bosses have a 50% chance of having a black hood, with a chance that the hood will be enchanted. Hoods & enchanted hoods have a small chance of showing up in loot. Hunters will use a greater variety of clothing (farm clothes, fur armor, or hide armor). Some hunters in cold regions will may use Skaal outfits. 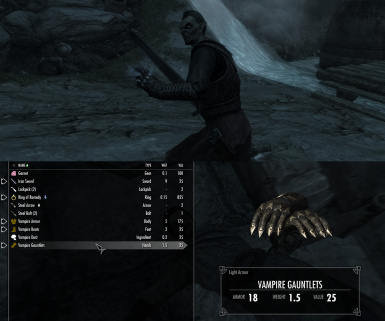 DAWNGUARD: Vampires will now occasionally spawn with Vampire Gauntlets and/or a Vampire Hood (playable version of Serana's Hood). DAWNGUARD: Vampire Bosses now use a separate boss outfit and will always be wearing armor & gauntlets. They will no longer be found wearing clothing or robes. Nightmaster Vampires will occasionally spawn with Vampire Lord armor. 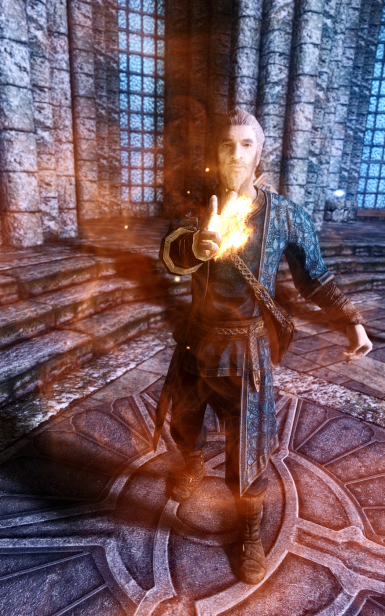 DAWNGUARD: Vampire Mages are more likely to wear robes than Missile or Melee vampires (though missile & melee can still be found wearing robes). 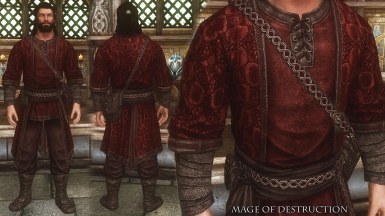 Some Dark Elves found around Skyrim will now be wearing the Dunmeri Tunics from the Dragonborn DLC.